Multi temperature wine cabinets have a different temperature from the bottom of the unit to the top. Ideal for a varied wine collection, store sparkling at the bottom, white in the middle and red at the top. Perfect for a varied collection for home users and on trade. Multi-temperature wine cabinets offer multiple temperature zones for different wine chilling requirements. They are especially suited for storing different types of wine at their respective drinking temperatures as well as storing wines at recommended temperatures for long term storage. These wine cabinets are ideal for large wine bottle collections and also offer the perfect conditions for the long term maturity of fine wines. The design and style of multi-temperature wine cabinets differ from brand to brand, but all multi temperature wine fridges offer you plentiful storage. You can store your red wine in the upper section, white wine in the middle section and sparkling wines in the lower section. Multi-temperature wine cabinets are innovative and functional; perfect for wine experts, enthusiasts and sommeliers. Multi-temperature wine cabinets are also ideal if you do not have a wine cellar. View our selection of Multi Temperature Wine Cabinets! These appliances are perfect for both household and commercial use. A multi-temperature wine cabinet is useful if you are interested in trying different kinds of wines. 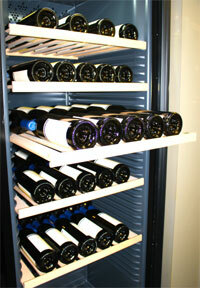 You can organise your wine bottle collection in separate temperature controlled compartments. Each design differs with bottle holding capacity, so you can find the right size multi-temperature wine cabinet for your collection. There is a wide range of cabinets available so it all depends on your preference and style. 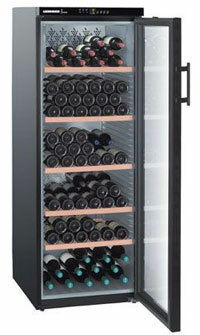 Wineware are pleased to offer Liebherr multi-temperature wine cabinets for all your wine storing needs. We have two Liebherr wine cabinet models: WTb 4212 Vinothek and WTr 4211 Vinothek. These appliances incorporate a special climate control system called the electronic control system which is easy to use and operate, keeping your wine at the correct temperature. Each layer in your wine cabinet can be set at the required temperature. For example, the top shelf can hold red wine at +18˚C while the bottom shelf at +5˚C can hold sparkling wine or champagne. Humidity should always be above 50% as lower levels can cause corks to dry and thus shrink. Subsequently this allows air to enter and damage the wine. Humidity can be increased using Lava stone in these multi-temperature wine cabinets. Wineware has produced a specifications chart for the two models below. These two models are very similar but have a few specification differences, for example the Liebherr WTr 4211 Vinothek does not have an interior light. Interior lights can really show off your wine collection, so it is always important to read specifications fully. Both models are versatile and powerful wine cabinets ideal for storing your wine collection. This is not a definite list of features for all multi-temperature wine cabinets however it does provide a general overview of what you can expect or need to look for when purchasing your wine cabinet. The electronic control system ensures wine is kept at a constant temperature. The temperature is maintained even in the event of fluctuations in the ambient temperature. This means your wine is not spoiled and oxidisation is prevented. Long-term storage- the electronic control system provides the perfect conditions for storing wine. Wine can also be kept at the optimum drinking temperature. (If you are unsure about the temperature for serving your wine please refer to Wineware’s ‘Perfect Drinking Temperature for Wine Guide’). Optimum air freshness- this is achieved by the appliance. Some models are fitted with activated-charcoal filters which prevent odours from the air affecting the taste of wines stored inside the wine cabinet. Usually it is advised that air filters in these cabinets are replaced every year as this guarantees air quality and freshness for wine. Humidity- humidity levels are controlled by a vaporiser system and constant air circulation. Liebherr cabinets are designed to ensure the best conditions for both cork and wine. The correct humidity levels are guaranteed by wine cabinets. Low vibration compressors- these compressors ensure wine is kept in gentle storage, free from disruptive vibrations. Shelving options- wine can be stored in different ways on a wine cabinet’s shelves. Some wine cabinet designs allow wine bottles to be stored at an angle and this looks fantastic in any household but still ensures the corks are kept in contact with the wine in the bottle. The wine bottles are held safely and securely by the wine cabinet’s shelves. Soft closing- wine cabinet doors are able to close automatically when opened to an angle of about 45˚. The door closes softly and safely ensuring wine is free from vibrations. Insulated doors with UV protection- these insulated doors minimise the effect of UV rays on wine. LED lighting concept- wine is illuminated and spectacularly presented in wine cabinets using LED light spectrum. The LED light spectrum does not include any UV rays and therefore does not affect the wine. Feel assured your wine collection is stored safely. Perfect temperature and conditions for your wine (air freshness, humidity, protection against vibration). Easy to use/operate electronic control system. You can store wine according to its ideal serving temperature. Shelving options for different types of bottles. Show off your bottle collection with LED lighting! If you need any more information on our Liebherr multi-temperature wine cabinets or any other wine cabinets please contact us. We are always happy to help and will be able to advise you on the best possible option for your requirements.